What is the parallel between the sacrifice of Abraham and the sacrifice of Jesus? Jesus-Islam » His mission » What is the parallel between the sacrifice of Abraham and the sacrifice of Jesus? One day, God asked Abraham to sacrifice his son. He was to go to a place, a mountain, which God would show Him. When he came to the place of sacrifice, his son asked him where the lamb was for the sacrifice. 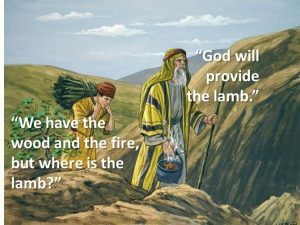 Abraham answered him that God would provide the lamb. However, he then bound his son, and put him on the altar over the wood. As he stretched out his hand to sacrifice it, an angel of the Lord called to him from the heavens, summoning him to do no harm to the child. Abraham looked up and saw a ram behind him caught by its horns in a bush. Abraham took the ram, and offered it unto the LORD in place of his son. God had himself provided a substitute in place of his son who was to die. Instead of his son dying, it was the ram.